Making a Mountain out of Your Mole Hills? Eastern moles occur throughout Florida, and are not rodents but actually mammals. They are insect eaters with large, powerful front feet, designed for pushing soil out of its way. The eastern mole has an average total length of 5 1/2 to 6 inches and a short, sparsely haired tail that is 1 to 1 1/2 inches long. The fur is very soft and differs from that of most mammals because it does not project toward the tail. With their fur pointing up, moles can move forward or backward within their tunnels without rubbing their fur the wrong way and trapping soil in their coats. The coat is so fine and dense that it keeps out water and dirt. If your soil is rich in organic material and supports a large earthworm population, insecticide treatments will not necessarily discourage moles. Also, be aware that insecticide treatment of an area may cause moles to tunnel more to seek out a diminishing food supply. Several mole repellents are available that use emulsified castor oil to repel moles from treated areas. The duration of effectiveness of these products is related to soil type and the amount of rainfall. They remain effective longer in clay and loam soils than in sandy soils. During rainy periods, these products may need to be applied more often. Always read and follow label instructions. 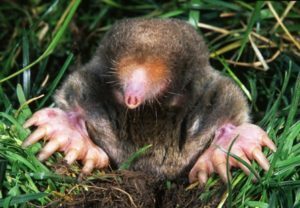 The eastern mole prefers loose, well drained soils. The characteristic mole ridges that lie just below the surface are foraging tunnels, which are created as the mole searches among plant roots for the earthworms and insects on which it feeds. Moles are beneficial because they eat grass and plant damaging insects such as mole crickets, beetle larvae (white grubs and wire worms), ants, moth larvae and pupae (cutworms and armyworms), and slugs. They are known to paralyze earthworms by biting the worms’ brain/ganglion. The earthworms don’t die but can’t move, and the moles store them in deep chambers called larders. These food resources can be used when foraging conditions are unfavorable. Moles also help to loosen and aerate the soil. In loose soil, moles can tunnel up to 18 feet an hour. Their living space is in tunnels and chambers 6-12 inches below the soil surface. Soil from these deep burrows is pushed to the surface in small mounds. The mole’s nest chamber is 4-6 inches in diameter and lined with fine grass and leaves. Moles have one litter of two to five young per year. The young are born in March after a 45-day gestation period. They are large at birth relative to the size of their mother and are able to fend for themselves in about four weeks. The damage caused by moles is almost entirely cosmetic. Although moles are often falsely accused of eating the roots of grass and other plants, they actually feed on the insects causing the damage. The tunneling of moles may cause some physical damage to the root systems of ornamental or garden plants and may kill grass by drying out the roots, but this damage is usually minor. When mole tunnels become an intolerable nuisance, moles may be captured and removed without a permit by homeowners, renters, or employees of the property owner. 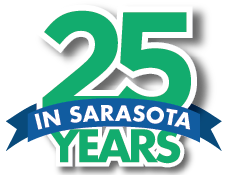 If a lawn service or pest control technician is hired to trap nuisance animals, that person must have a certified pest control operator’s license in lawn and ornamental pest control or the Florida Department of Agriculture and Consumer Services (DACS) wildlife certification for commercial mole control. 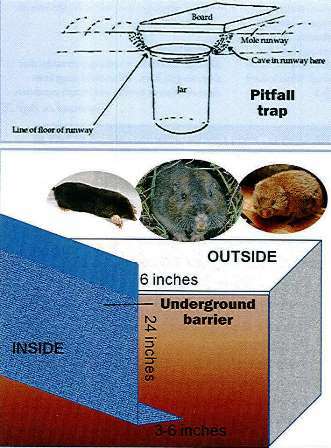 Moles can be live trapped using a simple pitfall, shown at right. First you’ll need to find an active surface tunnel. Collapse a tunnel with your foot, then come back in an hour or two to see whether the tunnel has been reopened. If the tunnel has been pushed back up, it is an active tunnel. Dig a hole through the tunnel large enough to insert a large coffee can, wide-mouth quart jar, or similar container. Sink the can into the ground so the top of the container lies just below the bottom edge of the tunnel. Cover the area with a piece of cardboard or a board and the soil from the hole to keep light and air currents from alerting the mole to the trap. When the mole falls into the trap, the whole container can be pulled out of the ground and the mole carried to a forested area and released. Check your live trap several times a day. If this is not done, trapped moles may die from starvation or thirst. Commercial mole traps are available in several types: the choker-loop, pinch or scissor, easy-set scissor style and the harpoon. The harpoon trap impales the mole with steel spikes when the animal pushes up on the trigger. To improve soil penetration, the spikes should be worked into the soil prior to setting the trap. Step on the tunnel to partially collapse it and set the trap so the trigger is over the collapsed section of tunnel. A plastic bucket can be placed upside down over the trap to keep children and pets from disturbing the trap. The choker-loop trap kills the mole by squeezing it between the loop and the trap body. To set a choker loop trap, lay the trap next to the mole tunnel. Make two slits across the runnel with a spade. Seep on the tunnel between the slits to partially collapse it. The choker loops are inserted into the slits, and the trigger is positioned over the collapsed tunnel. Read and follow the instructions for any trap you purchase. If the trap is not spring within three days, move it to a new, more active location. Small, sensitive areas can be fenced using an underground barrier to keep out moles, gophers, and pine voles (see picture above). The barrier should be made with small-mesh galvanized hardware cloth, brick, or concrete. The barrier should extend at least 6 inches above the ground and 2 feet below the ground, with an outward projection extending 3 to 6 inches. Flooding the tunnels with water may force moles to the surface, but this method rarely works in deep, sandy soils like those common in Florida. The use of vibrating devices to drive away moles has not been proven effective in scientific trials. In fact, the presence of mole tunnels next to highways would seem to be evidence against the effectiveness of these devices. The same is true for the use of mothballs to repel moles. The mole just blocks off the treated tunnels and moves to a different part of the yard. Many people claim that putting sticks of Wrigley’s Juicy Fruit gum into mole tunnels will eliminate the moles. This is another method not proven in scientific tests.